On Oktober 7, the day of the opening of the Bosch Bloemaert exhibition I informed the communication department, Arthur Wheelock (because I know him personally) and associate curator Stacey Sell about their over-exposing a 500 year old drawing by Hieronymus Bosch ‘The Owl’s Nest’; inv. N 175 and N 190 ‘Old Woman, one holding a distaff and the other leaning on a stick’ both from the Franz Koenigs Collection. This means 15 month of museum light falling on a 500 year old drawing within three years time! ‘The Owl’s Nest’, during the last three years, was shown 3 month longer than the N 190 ‘Old Woman’. 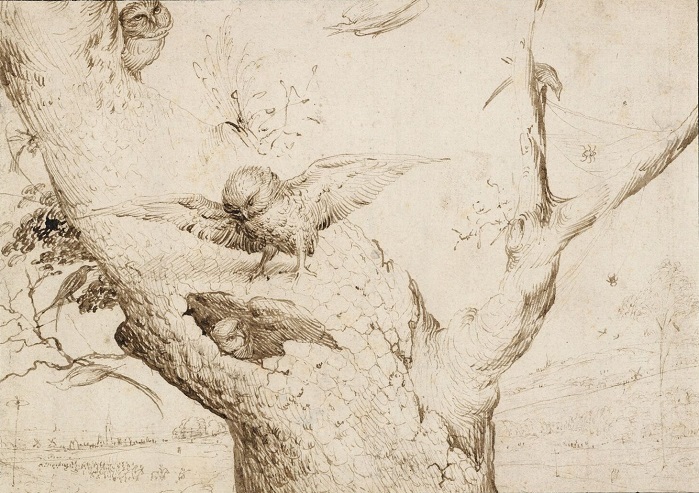 Boijmans Museum Rotterdam 1 November 2014 – 26 July 2015 though the exhibition showed three different groups of drawings, the here-mentioned two Bosch drawings were exhibited for three month. This extreme over-exposure is not appropriate and putting the drawings at risk. There is no excuse, after the planned exhibitions of Bosch to Bloemaert to also expose the drawings for over 6 months in commemoration of 500 years of Hieronymus Bosch. Of course the Museum Boijmans van Beuningen is solemnly responsible for overexposing the drawings at the 500 years commemoration exhibitions, having made prior arrangements with the National Gallery to show the drawings in 2017. Establishing the fact of their over exposure the National Gallery has its own responsibility towards these drawings, even when belonging to another museum, it is due to our mutual effort which preserves Cultural Heritage, World’s Cultural Heritage. Taking into account that exhibitions are planned long time in advance, the queue for showing ‘The Owl’s Nest’ was well apparent in 2013. Considering World’s Cultural Heritage, the National Gallery is equally held accountable in case of over-exposure and should check the amount of Lux the drawings were exposed to in the last two to three years. Relying on the professionalism of other museums is not always enough as is here proven. Museum Boijmans failed to face their responsibilities to these drawings, knowing their prior agreement with the National Gallery to show these drawings again for another 3 month in 2017, they should have refrained from showing the drawings at the two commemorating exhibitions of Hieronymus Bosch. Before delivering the drawings to the National Gallery, Museum Boijmans aware of their overexposure failed to refuse to exhibit these drawings and store them in their boxes, and keep them in the dark for the next years, due to their obligation to the National Gallery. Probably to be in demand as a Museum – because of the iconic Bosch drawing – and the thrill to be in partnership with the most prestigious museum of America, makes them forget their primary role as keepers and carers of the art in their custody. It is Franz Koenigs’ cultural heritage, and as family of the collector we would like to stretch the fact that these drawings belong to World’s Cultural Heritage for which its care seems to be lacking. Please take these two drawings from the wall and put them into their respective boxes and keep them in the dark till they will be taken back to Rotterdam. The image carrier for this exhibition is the ‘The Owl’s Nest’ by Hieronymus Bosch, N 175 from the Franz Koenigs collection: https://www.nga.gov/exhibitions/2017/bosch-to-bloemaert-early-netherlandish-drawings.html. The two drawings by Bosch showing at the National Gallery of Washington D.C. are both from the Franz Koenigs Collection, N 175 the ‘Owl’s Nest’ and N 190, ‘Two Women, one holding a Distaff, the other leaning on a Stick’. We are deeply concerned about the over-exposure of these Bosch drawings. These two drawings are the only Bosch drawings in the Netherlands. ‘The Owl’s Nest’ is Hieronymus Bosch key reference drawing. In 2016 marking the 500 years of Hieronymus Bosch, the drawings were exhibited for 3 month, from 10 February – 8 May in Den Bosch, at the Noord Brabants Museum and then flown to the Prado in Madrid (Spain) were ‘The Owl’s Nest’ was exhibited again for 3 1⁄2 month from 31 May – 25 September. Therefore in 2014 - 2015 ‘The Owl’s Nest was shown to a maximum of 50 Lux (without UV radiation) for over 6 month. And again for 61⁄2 month for a 500 years commemoration of Hieronymus Bosch. This is exceeding all norms of general consensus about the exposure of rare vulnerable Old Master Drawings to a certain amount of light. Generally drawings after a three month exhibition period, are kept in the dark for the next two to three years. In 2013 the Rotterdam museum, The Fondation Custodia and the National Gallery lined up three exhibitions of the Bosch to Bloemaert exhibition, starring the two Bosch drawings from March 2014, three months in Paris, from November 2014 three months in Rotterdam, from Oktober 7, for three months in Washington. In between Rotterdam 2015 and Washington 2017 the two Bosch drawings were shown in 2016 for three month in Den Bosch, and the iconic drawing The Owl’s Nest was shown for another three month in Madrid. A calculated 15 month of exposure within three years’ time. We are talking about the cultural heritage of the ‘Franz Koenigs Collection’ and therefore we talk about World’s Cultural Heritage. We all, worldwide, should be concerned how museums care, treat and preserve the art given into their custody. This is a clear case of over-exposure and commercial exploitation of the Museums possessions, versus their duty of primarily preserving the art in their custody. The National Gallery of Art at Washington DC thus having been informed of the over-exposure of the two Bosch drawings should take the appropriate decision and remove the two Bosch drawings from the Exhibition, and put them in their respective boxes, and store them in the dark to await their return to Rotterdam. Anybody concerned could have noticed this case of over-exposure, as last years Bosch exhibitions were very well visited and most visitors will have a memory of the drawing ‘Owl’s Nest’. However as the collector’s family we are probably more triggered by the images of his drawings and care more for their over-exposure then others. Some 100 of the finest drawings by Netherlandish artists born before 1585 are brought together in this exhibition from the collection of the Museum Boijmans Van Beuningen. Featured are nearly every form of drawing made by draftsmen throughout the period, from figure studies to stained glass window designs, nature studies, biblical subjects, and genre scenes. The exhibition also gathers works in a variety of media including metalpoint, pen and ink, brush and wash, chalk, charcoal, and watercolor. Highlights include 15th-century studies from the circle of Rogier van der Weyden, two sheets by Hieronymus Bosch, six drawings by Pieter Bruegel the Elder, and a selection of works by Abraham Bloemaert. A fully illustrated catalog accompanies the exhibition.